The British outdoor season kicked off again a week ago in Cardiff with the first instalment of the UKU Mixed Tour. David Pryce summarises the weekend’s action. A grand total of 52 teams descended on the University of Cardiff sports fields including two trialling (now selected) World Games teams, GB U23’s and Ireland’s U23 squad. 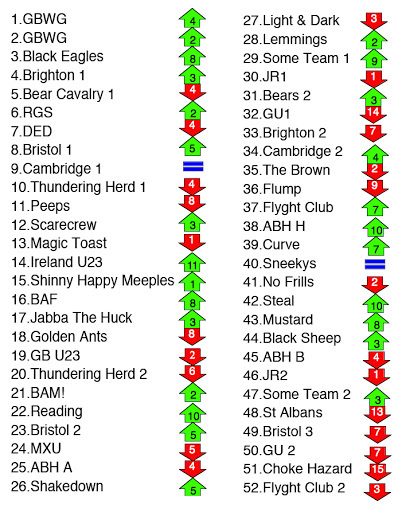 Alongside these national squads the regulars canada goose Calgary Jakke mænd of Bear Cavalry, Thundering Herd and Brighton were mixed in with newer/pick up squads Royal Goaltimate Society (RGS), Magic Toast and Meeples. Further down the seedings we saw the likes of Reading, JR, Guildford, ABH, Steal and many more battle it out for a possible higher seed at the next tour. Some of these falls are most likely to do with strong players going to new teams or not playing at all but in general I think the returning national players missed over past canada goose Canada Goose dame few years now in the WG, Magic Toast, RGS teams has pushed the standard up once again. The teams eating up seeds appear to have worked really hard and fought out every game, everyone loves a challenge and being that initial underdog can really work in your favour. Black Eagles yet again perform well after a solid season last year. Brighton are always high in the tour and remain solid at 4th. Some Team rising from 38th to 29th have really found some flow. Bear Cav were missing their main man Dave Tyler and so didn’t top the club team table but I wouldn’t count them as out yet. For teams in the top 10 anything can happen. GBWG really showed us what they plan to take to Cali with everyone able to pick the disc up and scoring easily with defences lagging behind. Look out for them as one team in Manchester. Ireland U23 were probably a little under seeded but still came out strong. In a similar manner to their slightly older beach counterparts played a very good mixed game to secure some invaluable playing time together. GB U23 had a great Saturday but struggled a little on Sunday with team dynamics holding them back at times. Some true moments of great ultimate were mixed in with a few too many turns and mis communications. These guys and gals will definitely be back next tour and will hopefully use the great training they are having to step it up ready for Worlds this summer. Remember to LIKE, SHARE, TWEET and CONTRIBUTE. Final positions and how they have moved. A good point! Was easier to refer to seedings/scheduling as done by the TDs. I can imagine it is such a painful job and the UKU C&S committees have and continue to do a great job. Will refer to them rather than TDs in future posts 🙂 tSG.